Yesterday I noted on sansmirror.com that the mirrorless camera and lens deals were cranking up, most notably the buy one and get one free sale from Zeiss for their E-mount and X-mount twins. DX lenses: 40mm macro, 85mm macro, 16-85mm, 18-140mm, 18-300mm, 55-200mm, and 55-300mm. FX lenses: 28mm, 50mm (both versions), 60mm macro, 85mm f/1.8, 105mm macro, 16-35mm, 18-35mm, 24-85mm, 24-120mm, 28-300mm, and 70-300mm. Discounts range from US$20 to US$300. Curiously, you can bundle DX lenses with FX bodies. NikonUSA themselves had a big email blast last weekend that featured the D610 plus the 55-300mm DX lens, for example. What’s going on? Well, NikonUSA’s inventory of the latest and greatest items isn’t all that deep at the moment, apparently. I hear from one source that Nikon’s current inventory is significantly lower than Canon’s, for instance. That means that Nikon doesn’t need to fix inventory problems as much as some of the other camera companies do, so…just some basic discounting going on at the moment. I still believe this will pick up at some point. Are there some gems in there you should think about? Well, first, you need to be buying a new body to get the discounts, so make sure you understand that first. But assuming that you’re buying a new DX body, the 16-85mm is certainly a nice choice to pair with the 24mp cameras these days. If you’re still using an 18-200mm, both the 18-140mm and 18-300mm are actually better matched to the higher resolution sensors, in my opinion, with the 18-140mm being the one I’d choose. Also, a 50mm FX prime makes an adequate substitute for a DX portrait lens; not perfect, but still something to strongly consider. FX users get a slightly better choice, with the 28mm and 85mm f/1.8 primes being two strong candidates for any of the FX bodies. The 16-35mm and 105mm macro are worth considering, too. But don’t discount the more kit-like FX zooms. The 18-35mm and 24-85mm are both quite good for the bodies other than the D800, and there’s that ubiquitous 70-300mm for a smallish telephoto option, too. There’s no screaming bargains this time around, especially since you have to buy a camera body at the same time. Still, if you’re upgrading your body, you’ll want to at least look through that list and my suggestions to see if something there fits into your budget. Note that the camera companies have all become a bit like car companies: there’s always some discount going on except for the very latest and greatest. They’ve conditioned customers to expect discounts. This is dangerous ground. For example, note my reaction: meh. These aren’t big enough discounts compared to what we’ve become accustomed to that would move an existing Nikon user to buy when they don’t need to. One final thing that was interesting to me. The lenses offered are pretty much all what Nikon would think of as their “high volume” lenses (the 28mm f/1.8 might be an exception). There’s a strong consumerish bent to this latest round of instant savings. 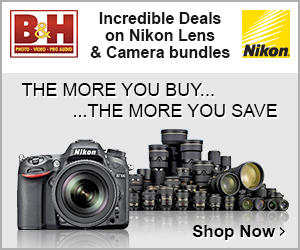 So Nikon is still targeting new-to-Nikon users for the most part. That strategy just doesn’t seem to die, which is making the long-time Nikon users more and more nervous.